German bombing raids on London throughout World War II left much of the city in rubble. 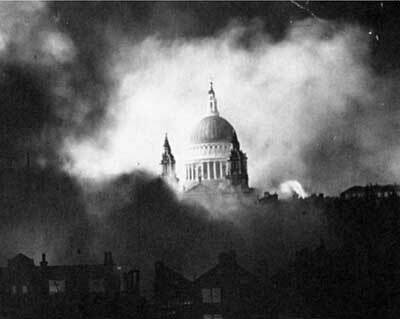 St. Paul's Cathedral during a fire after a bombing raid on London in December 1940. World War I, 1915-1918: In May 1915, German Zeppelin airships carry out the first of many bombing raids that year on London, killing seven and injuring 35 others. At first, the British lack proper defenses. But by mid-1916, British planes begin carrying explosive and incendiary bullets that could penetrate the Zeppelins' tough skin and set them ablaze. The WWI raids kill around 700 Londoners. 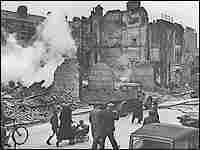 1939: The Irish Republican Army (IRA) begins a bombing campaign in Britain, striking targets in London and other cities in January. The worst attack occurs in August in Coventry, where a bicycle bomb kills five people and injures about 100 others. World War II, 1940-1945: In September 1940, the German Luftwaffe begins the Blitz, an intensive, almost nightly bombing campaign that lasts through May 1941, leaves much of London in rubble and claims at least 40,000 British civilian lives. Before the raids begin, hundreds of thousands of children are evacuated from London and sent to the countryside. During the Blitz, city residents frequently take shelter in the London Underground. Some, tired of going back and forth from home, move into the tube stations, where as many as 177,000 people take shelter. 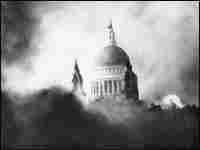 Major structures damaged during the Blitz included the British Museum, St. Paul's Cathedral, Westminster Abbey and the House of Commons, which is nearly destroyed. 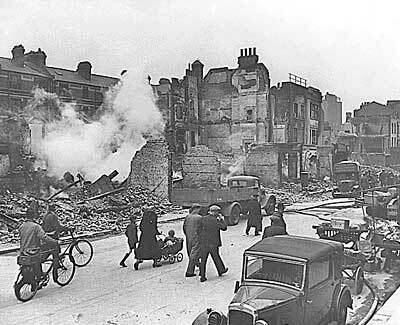 Though the Blitz ends in 1941, German raids on London continue through 1945. One of the most devastating of these later attacks is a strike on South London in June 1945, which kills 119 people and injures 102. Fires from four years of bombings decimate London's housing stock. Hundreds of thousands are left homeless. In 1948, still devastated by the war's aftermath, London hosts the 1948 Summer Olympics. Oct. 31, 1971: A bomb explodes inside the Post Office tower in London (later renamed the British Telecom Communication Tower). 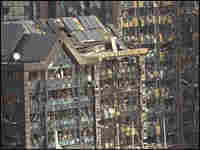 No one is injured, but the blast causes extensive damage. Police receive a call claiming the "Kilburn Battalion" of the IRA is behind the attack. March 8, 1973: In an infamous attack, 12 IRA operatives place four car bombs in London. Ten are arrested trying to leave Heathrow airport, and two bombs are defused. The remaining two bombs explode, killing one person and injuring some 180 others. Sept. 1973: On Sept. 8, a bomb explodes at London's Victoria station. Two days later, bombs explode at two Underground stations in central London, injuring 21 people and sending central London into chaos. Forty-eight hours later, more blasts rock London's Oxford Street and Sloane Square. The IRA claims responsibility for all of the attacks. June - December 1974: The year 1974 was one of the deadliest in the IRA's bombing campaign of mainland Britain, with several blasts targeting London. In June, the IRA bombs the House of Parliament, causing extensive damage and injuring 11 people. The following month, an explosion at the Tower of London kills one person and injures 41 others, including eight children. The blast leaves many victims with badly damaged or lost limbs and serious facial injuries. Though the IRA is suspected in the bombing, no group claims responsibility. In October, a bomb explodes at a London club whose members include retired British military officers. Three club staffers are injured. In December, the London home of Conservative leader Edward Heath is bombed; Heath is unharmed. 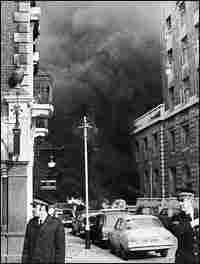 Sept. 5, 1975: An explosion at a hotel in central London kills two people and injures 63 others. The IRA claims responsibility. Jan. 29, 1976: During the night, a series of bombs rock London's West End, injuring one person. March 30, 1979: A car bomb outside the House of Commons kills Airey Neave, the secretary of state for Northern Ireland. The Irish National Liberation Army, an Irish republican paramilitary group associated with the Irish Republican Socialist Party, claims responsibility. 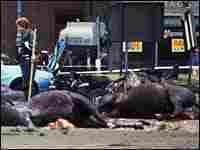 July 20, 1982: Two IRA bombs explode in central London less than two hours apart. The blasts at Hyde Park and Regents Park kill 11 people and injure 50 others. Dec. 17, 1983: Six people are killed and as many as 90 are wounded by an IRA bombing outside of Harrods department store in west London. The blast takes place during the busy shopping period before the Christmas holiday. July 20, 1990: The IRA bombs the London Stock Exchange. Nobody is injured in the blast. April 10, 1992: The IRA bombs the Baltic Exchange in London, killing three people. April 24, 1993: A massive truck bomb parked in Bishopsgate tears through London, killing one person and injuring more than 40. Most of the wounded are security guards and maintenance staff. The blast shakes buildings and shatters windows, destroying a medieval church and the Liverpool Street Underground station, and causing hundreds of millions of dollars in damages. In response, the British government erects a "ring of steel" around the city. Feb. 10, 1996: A truck bomb rips through the Canary Wharf office development in the Docklands area of London, killing two people and wounding 39 others, and causing more than $127 million in damage. In 1997, the IRA agrees to another provisional cease-fire deal. Voters in Ireland and Northern Ireland approve the peace deal known as the Good Friday Agreement in May 1998. June - September 2000: In June 2000, the Real IRA, an Irish republican splinter group opposed to the IRA cease-fire, fires an RPG rocket at the headquarters of MI-6, the British foreign intelligence agency, in London. March 3, 2001: Early in the morning, a car bomb targets the London offices of the BBC. One man is injured. Authorities suspect the Real IRA. April - May 2001: Two bombs strike a north London post office within a three-week period. No one is injured in either blast, which are linked to the Real IRA. Aug. 3, 2001: A car loaded with explosives detonates at the busy Ealing Broadway shopping center in west London, injuring seven people. The blast occurs just after midnight, as hundreds of young people are exiting pubs and clubs. 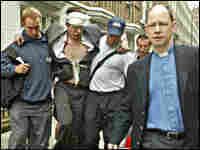 July 7, 2005: London is brought to a standstill when four explosions on the city's transit system leave scores dead and injured. Britain's Tony Blair says it is a terrorist attack. An unofficial claim is made on the Internet by a group calling itself the Secret Group of al Qaeda's Jihad in Europe.